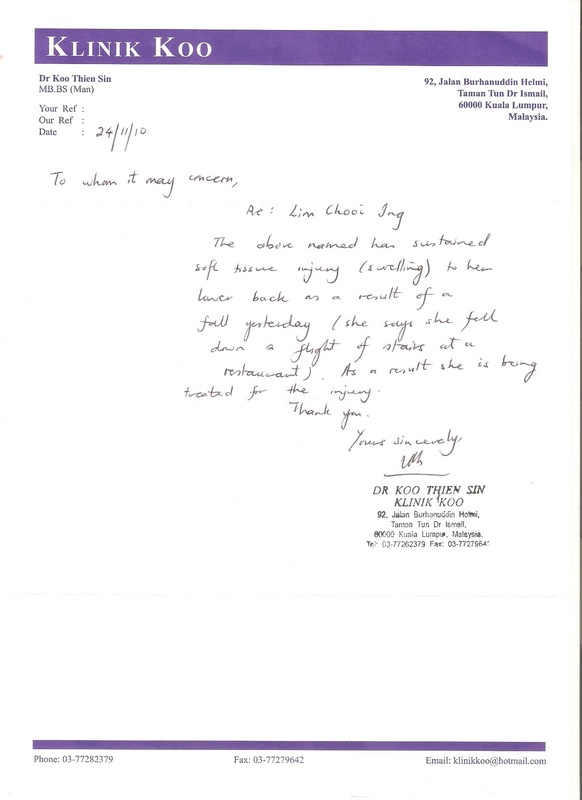 I am writing to complain about the injury sustained from the fall at the staircase of your Fullhouse Sunway Giza Mall outlet and also the level of service provided by the management of this outlet towards your customers. 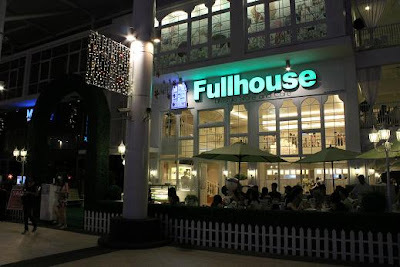 On 23rd November, 2010, I attended an event held at Fullhouse Sunway Giza Mall outlet. Since I was early, I decided to leave the cafe to window shop around Sunway Giza Mall (approx. 2pm). While coming down the staircase to the ground floor, I slip and fell down the stairs on my back which caused me pain throughout the event and up till todate. 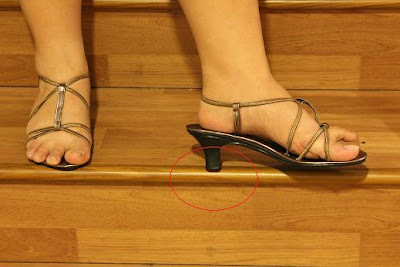 I was not wearing high heels (I am wearing flat sandals) and I was holding the handrail when I used the staircase. That did not help in preventing my fall as the staircase is slick, slippery and steep. I had to use my left foot to jam my fall while my left arm bang on the handrail. There was a loud bang when I fell and to my surprise nobody (your management) came to check or was in any way concern with what happened. I find this very disturbing as it shows how humble your cafe is towards its customers. When the event ended at approximately 5pm onwards, again I had a near miss fall at the same staircase and this time being conscious of what happened, I still nearly slip! Unfortunately one of the attendants of the event, a man while he was also coming down the same staircase, slipped and fell with a loud bang. This time along with a few customers, we saw an Indian man in jacket (manager?) rushed to check what happen. However when a lady customer complained to him about what happen and that the staircase was dangerous, the Indian man promptly ignored us all and left without even saying a word! 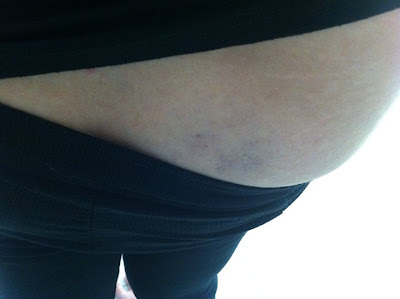 Another incident happened whereby another customer also had a near miss fall from the same staircase as witnessed by me. It is alarming how many customers had fallen or nearly fall from this staircase. 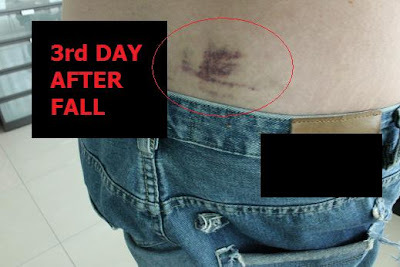 The injury had left me with swelling on my lower back (kindly refer to the medical note from Klinik Koo attached herein for your attention) with blue and black marks and blood clots. My left foot is sprained and I feel pain from my lower back to my waist. I cannot sit down without feeling pain and any pressure to the area will also be painful. I cannot sleep comfortably at night without hurting my back and I find it difficult to bend or to sit normally. The pain and suffering I am experiencing reminds me of this incident and I am compelled to write to your management to report and complain what happened. 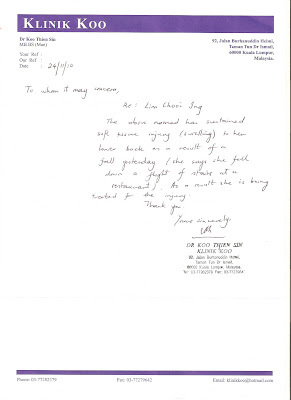 Please refer to the photos attached in this letter for my lower back injury (taken on 28/11/10). It has been a week and I am still suffering pain to my lower back! lining on end is ROUNDED N SLIPPERY as well! DANGEROUS FOR WOMEN WITH HELLS? Your cafe had failed to provide reasonable care and safety to your customers. There is no prevention or effort on your part to ensure customers would not slip down the slick staircase which is wooden and has an oily substance or material lining it. I have observed that your staffs used this staircase and walk up and down from the kitchen with it, transferring oil or any greasy substances from there. I heard many people had fallen on the same staircase and till today, Fullhouse has not taken any steps to stop the problem from reoccurring. In fact, Fullhouse seems to think this is a normal occurrence and ignores customers who fell down and get injured. 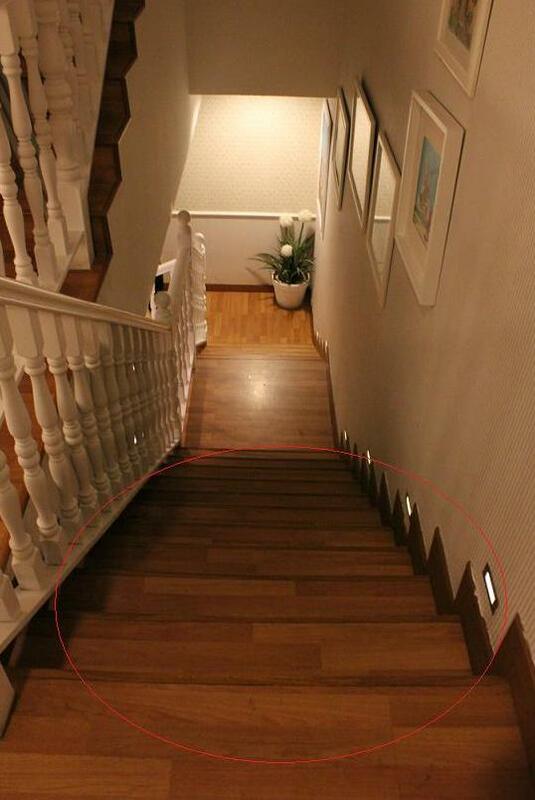 What happens when an elderly slips and falls as this staircase? I dread to imagine if a pregnant lady suffers what I had gone through? I demand an explanation to why your management had failed in such areas and in ignoring those who fell down your staircase like it was a normal day to day incident. I look forward to hearing what your management has to say about what happened to me. Failure in doing so, I would take report this matter to the appropriate channels and take legal action to the pain and suffering that I experience since my fall at Fullhouse Sunway Giza Mall outlet till todate. This complain has been forwarded to the management of Sunway Giza Mall for their attention. I believe in the safety of our people in this country and companies must buckle up to ensure that we do not get harm in their premises especially elderly, pregnant women, and those with health or back problems might be seriously hurt. To further support what happened, I have several witnesses who saw me and the other man fall on the same area and they are ready to testify. thanks Miu Miu for writing the complaint and alerting us about it. I do have to agree that all restaurants need to ensure care and not cause anyone to be in a dangerous situation. I have a few friends who are pregnant and dread the thought of them falling down that steep staircase! huh i also =_= dam piss off when i think about pregnant woman! imagine if i was pregnant 3 months? i would still go makan at cafes/restaurant not knowing what lies ahead! crappy shiat restaurant. Popular interior all look nice? LOOK NICE! NOT PRACTICAL ONLY! too bad that no one concern and even...ignored you ?!!! At last they should take a look and ask if you are fine ! How if the one who fall down is elderly / pregnant ?! The revonation fees might be highly cost but life is valueless loh ! U ARE SO RIGHT ANNA! RENOVATE WILL COST BUT IT SAVES LIVES! huh.. what if a rich DATUK FALL HERE? SUE THEM ON THE SPOT? hi miu miu, can i link this to my FB account. so that people are fully aware of that mentioned premise. they deserve to know the truth! Miu, I think the management shud be held responsible for this incident. I do not know how you want them (FullHouse group / owner) to compensate to you, be it in monetary or medical expenses. Judging from your photos, going to a normal GP clinic is not enough. 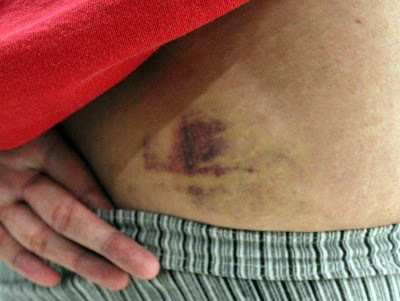 Do get an X-ray scan as the bruise is located at / near your hip bone. If the hip bone is cracked, you may have difficulties in bearing a child, in the near future. Not to say your fertility is gone, but all women need their hip bone muscle & strength to support a growing foetus inside the womb. wth wei.. This is seriously too much lo.. He just walked away without even saying sorry? And the staircase does look dangerous. I don't like the fact that they are all the same colour. Someone with bad sight (elderly) may not be able to see properly where the next step is. And it's so high sumore x.x Good for you for reporting this! Hope your back gets well really soon. The bruise looks bad.. This is serious!Perhaps the management should look into this matter since there is a few cases where customers actually slip and fall. tis is RIDICULOUS...ignored u other victims n jus walk away? my heart beat super fast wen i c d staircase...OMG...so steep n d stupid rubber tap..i can easily fall more than 10 times k! Hope FULLHOUSE wil take tis matter seriously ...NO MERCY! Frequent case of people falling down from the same staircase? This is serious problem and the management shall take responsibility for all this! So did you forward this to newspaper as well? I went there once, I banned it from my list immediately. I did not have your unfortunate experience BUT i can agree that their service is REALLY BAD!. Barely tried to find me a table. Even when i want to order they ignored me.. busy chatting, the staff and even that manager guy! Their service pay no effort at all towards the customers happy and safe being. One of the drinks Aloe jasmine or whatever it was, the aloe was not fresh, it had the taste of going bad. Tammy, your injury looks really bad. I really hope they do something about this because it is very serious matter. on a side note, you take care alright? Try not to do too much walking. Don't die! Please don't die! The staircases, those innocent staircases still love and need you! Ouch Miu! so sorry to hear this! they better compensate u with the right amount. You know bad falls dont go easy.. The pain might come throbbing now and then. So they better take this issue seriously!.. Miu, hope u feel better soon dear..
Wow thinkin abt the dangerous staircase, i might think twice of goin there. I rather miss the food there than suffer a fall there. Glad u wrote this out, and i do hope the management take this seriously on the safety of their customers. wow this is serious. if pregnant woman more worst. never been there yet. I mean this restaurant. I must praise you for your heads-up and giving us warning on this place. My friends recommend this place to hang-out but looks like we need to blacklist already!! I pray for your speedy recovery! Please let us know if the management is doing anything to rectify this matter. The management should do something about it. This is just not right. Having a person falling down and swelling like that is no joke. You could have broken your neck if things went really wrong. Eeks!! That is terrible! A real hazard! Who'd want to go to a house like that. Should report to papers, like that NST weekend one where they post real issues and contact the management for you. Was there even a sign to say,"Watch your step, slippery floor?" Blacklisting until this problem is fixed!! Hope you get better soon dearie. Can't imagine sleeping at night. Sleep on left side foot pain, sleep on right side back pain. So sorry to hear about this incident. I've never visited this place and I guess, I don't have to. I hope the management had already apologize to you for such mishap and have taken proper preventive measurements. You can sue them in court. GREAT JOB TAMMY!!! HOPE EVERYONE WILL BE "EXTRA" CAREFUL DINING AT FULLHOUSE. NAMPAK AJE CANTIK TAPI TAK BERMAKNA KECANTIKKAN TU!!! oh my my that is quite a BAD FALL! I noticed that you mention, what would happen if you were 3 months pregnant. Newsflash... you look the part. yea you got that damn right..
"I think the bruise is bad due to your size." First, this is a somewhat sexist or discriminating comment. And by you mentioning you are normal build, yes you might be a normal build (which is tiny in Europe but normal in Asia) but that's just you. And your generalisation doesn't work. It is this place she fell, not every other places with steep stairs. This is negligence under health and safety rules, which is highly disregarded in this part of the world. And under civil law, she could actually sue them under the act of negligence. And so you call yourself considerate, that is the joke for the day for me. I hope you will not hate your daughter if she will even be born or become ugly, either by genetic nature or unforeseen accident. Then you would probably see how pathetic you were but I bet you couldn't. thank you poseylass for your kinds words, i didn't read the comments anymore but i got a notification from my email that u commented and i check what u said. I refused to read what Mr. Considerate wrote still bcoz by seeing his nick name, I got a feeling what he's gona/is saying. Yet now while i am commenting this, i cover his comments. From your comments, It's really immature to say the bruise is bad due to my size, the bruise shouldn't be there in the first place, regardless of my size. Also maybe it's thanks to my size, I didn't actually BREAK MY BACK? which could be more serious than what I am having now. Haven't pulled them out, but from what I've read the soles somewhat heel themselves.